The best parts of Street Fighter and BlazBlue combine in this epic 2D fighter! Easy to pick up but filled with tactical depth that will have you playing for years, UNDER NIGHT IN-BIRTH Exe: Late is the frantic new fighter from the maker of cult-classic Melty Blood - and the hit underground Japanese brawler that has captured both the imagination and hearts of the fighting game community. 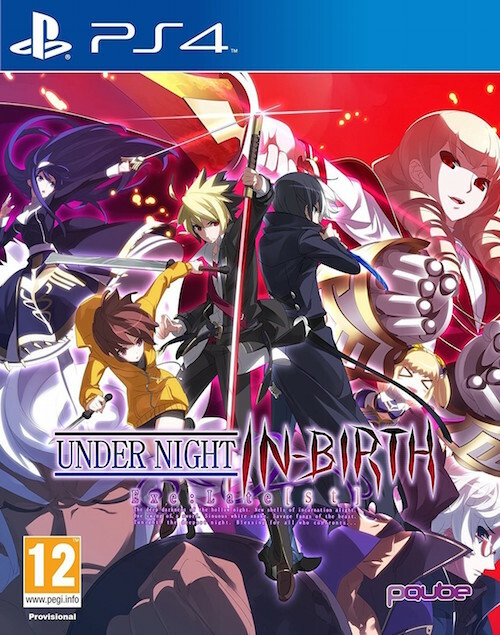 - PlayStation's Hottest New Fighter - Discover the stunning UNDER NIGHT IN-BIRTH universe in this complete edition of the celebrated four-button fighter. - An Amazing Contemporary Cast - Wield swords, daggers, whips, scythes and even killer hair braids with a colourful roster of 20 unique and audacious fighters. - Accessible, Tactical Combat - The easy-to-understand 'Grind Grid' mechanic rewards smart offensive play but punishes sloppy and negative tactics to encourage considered tactics. - An Epic Story Campaign - Immerse yourself in the epic battle between In-Births and Voids with the story-rich Chronicle Mode. - The Fighting Genre's Best-Kept Secret! - The developer of cult-classic Melty Blood finally returns to the genre by popular demand!